We already know that the Galaxy S10 is Samsung’s 10th anniversary flagship product, as a exciting smartphone, it is world’s first “ultrasound” display reader. It is said that its screen cost exceeds $200 dollars, it will be released in March next year, there are already related accessories manufacturers began to design its accessories, such as CaseMe Case, it has announced the design of Samsung Galaxy S10 Case. If you like wallet phone case, this is your best choice, no need to carry a phone and wallet, the security is very good. It can hold a lot, there are about 14 cards that can be stored, and the zip pocket can store some cash and coins, which is very practical. The color is very beautiful, there are 3 colors: black, brown, red. It’s a bit cumbersome, but you get used to it, and the benefits of the feature are more than huge. 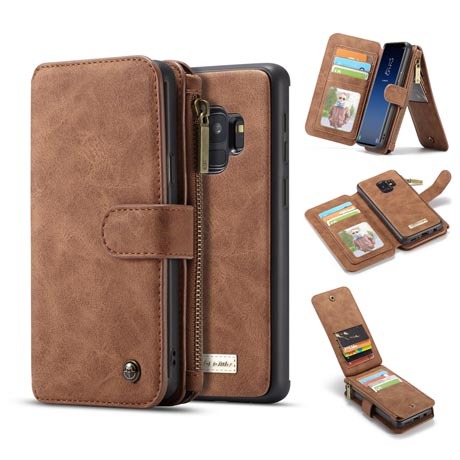 Of course, the Galaxy S10 and Galaxy S10 Plus use the same design, but the size is not the same, so the Samsung Galaxy S10 Plus wallet case designed is also like this, but the samsung official does not confirm the design of the Galaxy S10, so we still wait for more Information exposure.